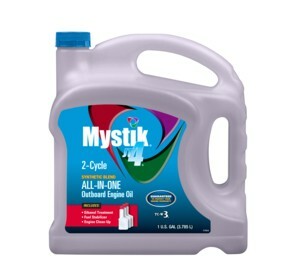 Mystik® Lubricants has just introduced a new two-stroke outboard engine oil, Mystik® JT-4®All-in-One, which is formulated to protect two-cycle marine engines from the detrimental effects of ethanol while saving money over the life of the engine. JT-4 All-In-One is a TC-W3-licensed, synthetic blended two-stroke outboard direct fuel injection or direct injection oil that includes fuel stabilizer, ethanol treatment and engine cleaner. Not only does it cost approximately half as much as buying those additives separately, it’s also guaranteed to protect your marine OEM warranties while taking the guesswork out of mixing ratios.